"Mommie Dearest" is the classic movie about what it was like growing up the daughter of a Hollywood star. The star, Joan Crawford, came to be seen as the epitome of the mother no one would want. 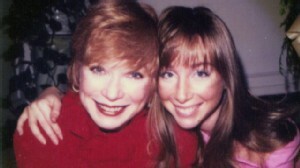 Now the spotlight is on the parenting skills of another Hollywood icon, Shirley MacLaine. MacLaine's lookalike daughter, Sachi Parker, talks about her childhood in the book "Lucky Me: My Life With -- and Without -- My Mom, Shirley MacLaine." Parker says MacLaine chose being a movie star over being a mother. Now starring in the hit series "Downton Abbey," MacLaine made her first splash as a singer, dancer and actress on Broadway. She went on to win an Oscar for her portrayal of a mother who has a love-hate relationship with her daughter in "Terms of Endearment." Similar roles followed, as in "Postcards from the Edge." PHOTO QUIZ: Kids of Stars: Who's the Parent? MacLaine's real-life daughter, Parker, is Hollywood royalty. Her uncle is MacLaine's brother, Warren Beatty. "Faye Dunaway would come over, and Sydney Pollack, and Warren, and Robert Redford," Parker said in an interview with "20/20." "I was so star-struck. ... I couldn't breathe around him. I couldn't speak to him even." But such moments were the exception, Parker said. For one thing, she said, her mother wasn't around much. "She was very absent," Parker said. "I was very lonely -- very lonely. Definitely. And I still struggle with abandonment issues and loneliness." In the book, Parker writes that MacLaine was always happy to see her for about four hours, and then suddenly she became a burden. When she was two years old, Parker said, MacLaine sent her to Japan to live with her father and MacLaine's husband, businessman Steve Parker. She traveled alone, she said. "It was a propeller airplane in those days, where it took a couple of days," Sachi Parker recalled. The stewardesses were her caregivers, she said. MacLaine remained in Los Angeles to make "The Apartment" with co-star Jack Lemmon. Her career came first, as she explained to Barbara Walters in 1990. "I saw my mother suppress her own creativity. I wasn't going to let that happen to me. First of all, children pick up on that and they feel guilty about ... having been responsible for your not realizing your creativity, so that was not going to happen," MacLaine said. Parker said she would see her mother over holidays and in the summer. "I missed her all year," she said. She lived primarily in Japan, with her father, who was verbally abusive, she said. He called her "the idiot" and wouldn't let her read, she writes in the book. MacLaine and her husband saw each other two or three times per year and had an open marriage. Parker said her father lived a lavish lifestyle, with a live-in mistress, but seemed to have no means of support. She was frequently left alone when her father went out on the town, recalled Yuki Banks, a childhood friend. "I would be at home with my mother. Sachi would call me and ... ask if she could come over because she was all alone," Banks said. As a young teen, Parker studied at a boarding school in Europe. One Christmas, she said, neither of her parents showed up at home. "I laugh now," she said. "But I have to say, at the time it was very scary and very painful. And I actually had a physical pain in my heart." A classmate's family saw her predicament and took her with them on a trip to Yugoslavia, Parker said. She felt guilty for imposing and left. With nowhere to go, she was taken in by an elderly couple for two weeks. She had no idea where her parents were, she said. She didn't complain when she did see them. "I was really brainwashed by the Japanese culture, but really by my father too, because I wasn't allowed ... to ask questions," Parker said. "I was taught never to inconvenience people." Parker's father, it turned out, was a con man. Steve Parker had lied about who he was and had married MacLaine for her money. When MacLaine found out, she divorced him after 28 years. Sachi Parker said that while MacLaine had been generous with her husband, that wasn't the case with her. Parker said she asked for $500 to buy a used car, and MacLaine loaned it to her with interest. "My mother was -- is very old-school regarding money and tough love," she said. Unable to afford college, Parker worked as a maid, waitress and stewardess. "I would look up, and the in-flight movie would be 'The Turning Point' or another [MacLaine] movie. And it would be a moment that I would find that I could be with her. She was right there. And I would just yearn for her," Parker said. Parker really wanted to be an actress, but she says her mother did little to help. She landed bit parts in "Peggy Sue Got Married" and "Back to the Future," but her career never took off. In 1986, she and her mother made a Diet Pepsi commercial. "Oh honey, you learn more from failure than success," MacLaine said in the ad. "That's kind of her," Parker said with a laugh. "Perhaps she wrote the script. I don't know." MacLaine became a bestselling author of New Age books, in which she wrote about her belief in reincarnation and UFOs. During this period, Parker said, MacLaine told her that the man Parker was living with was not her father, but rather his clone. Her real father was "Paul," who was orbiting in space at a cost of $60,000 per month that MacLaine had to pay. At the time, Parker kept her disbelief to herself to protect MacLaine's feelings, she said. Now, she said, she does not believe MacLaine had "a screw loose"
"I choose to believe that ... she was wide-eyed and so full of wonder." Today Parker is a single mother with two children: a 16-year-old son and a 14-year-old daughter. She said her relationship with her daughter is healing, but she is still looking for a Hollywood ending with her mother. They last spoke over the summer. "I try to understand her," she said. "I find myself wanting to protect her so badly, because I so love her. ... And yet the pain is very deep. I would hope that she would own it and apologize. That would really, really be wonderful." Parker said she hoped MacLaine would "see the positive" in her book. She sent her a copy with a note saying, "I love you." +Who's on Oprah's Upcoming Cable Channel?